Handicraft villages are an exciting point of culture that can not be missed during the travelers’ discovery of Vietnamese culture. This trip will enable the tourists to have a good look at and experience various handicraft villages from the pottery village of Bat Trang, the traditional painting village of Dong Ho to the silk village of Van Phuc. In the morning, tour guide and driver will pick you up at the hotel at 8:00 to start a spectacular trip to the most famous traditional villages in Vietnam. Many visitors have been seduced by rich in handcraft products which are made dexterous, hardworking and creative qualities of the Vietnamese people. 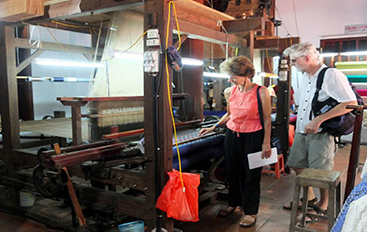 Villages in the vicinity of Hanoi are the cradle of skilled crafts, folk arts and traditional festivals. The first stop is the pottery village of Bat Trang to see how the beautiful ceramic products are made. Continue to Dong Ho, famous for its wooden paintings. Local lunch in Dong Ho. Afternoon tour to Van Phuc, a silk village is a great place to silk cloth being produced on the loom .There is a showroom where you can buy silk by the meter, much more exciting that buying it in the shops. Drop off at your hotel at the end of the day. Stalls and stalls of silk textile and clothes for sale. There are silk accessories for sale as well. If you are a silk lover, you must visit. I was more interested in watching them spin silk thread and weave silk textile. Very interesting. Loved the red silk thread. Buying silk fabric If you'd like to buy silk fabric then make sure and visit Van Phuc. They also have scarves, and other clothing but one of my goals in visiting was fabric and I found a lovely selection here. My family of 4 (2 adults and 2 kids) had a great time. The tour guide was very helpful in explaining to us various aspects of Vietnamese tradition and history in ceremic making as well as some of the sights along the way and at the village. We really had an enjoyable time and lunch was just perfect! Certainly recommend this trip if you have some time to spare.